"Following a final season of concerts across Europe’s most magnificent concert halls, cathedrals and festivals, three weeks in Asia and three US tours, David Hurley will sing his final concert with The King’s Singers in August. After an audition process spanning several months, his successor has now been appointed. The King’s Singers will welcome Patrick Dunachie as first countertenor in the group in September 2016. Born in September 1993, it was from his position as a chorister at Hereford Cathedral that Pat won a choral scholarship to King’s College, Cambridge. 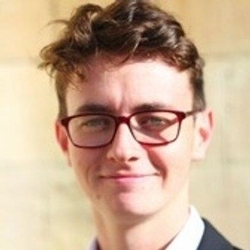 After graduating from King’s in the summer of 2015, Pat moved to Oxford where he currently sings as a Lay Clerk in Christ Church Cathedral Choir. He combines these roles with teaching and freelance work with various choirs and consorts, and as a soloist. He has sung as a soloist at the Three Choirs Festival and the BBC Proms, as well as with groups including Ex Cathedra and The King’s Consort. Former Musical Director of The King’s Men and a member of the Choir of King’s College, Cambridge, Pat has also prepared many performance editions of music from different countries and periods. He also has web and graphic-design, score transcription and engraving skills. Above all, Pat has an exceptional voice and is perfectly suited to the vocal and professional rigours of becoming a King’s Singer, performing in excess of 120 concerts each year around the world alongside education work and recording. "I am extremely excited to have been appointed to The King’s Singers after such tough rounds of auditions alongside some superb singers. I have been listening to the group’s recordings and concerts since I was very young, and I have always admired David’s singing, so it’s surreal now to be joining them. When I was about 14, I told my English teacher that my dream job would be singing first countertenor in The King’s Singers, and so I feel really lucky that the dream has come true!" Patrick will join this illustrious ensemble at an incredibly exciting time. He will play an important part in the group’s first Summer School in the US in 2017 as well as the third British Summer School just weeks later. As the group was founded at King’s College (Cambridge) in 1968, it’s particularly pleasing to welcome Patrick, a former King’s choral scholar, as we head towards the 50th celebrations in 2018."